Have you ever wondered how you got from a place of worshipping God, enjoying his goodness and feeling at peace, to feeling discontent with your life and yelling at your husband and kids on the same day? I sure have. I know that I love God and my innermost being wants to serve him, so WHAT HAPPENS between my resolve to follow him at the start of the day, and my utter failure by the end? Ourselves – of our sin and its despicability. God – of his grace and goodness. Attending to special duties that weaken the power of sin in general. “Know therefore and see that it is an evil thing and a bitter [thing], that you have forsaken the Lord your God.” (Jer 2:19). Did you catch that the fear of the Lord = departing from iniquity (sin)? They are both said to be what wisdom means. And God calls “evil” whatever is forsaking (rebelling against) him. So, putting it all together, if we claim to love God (which is what the fear of the Lord is), then we must make every effort to depart from sin (which is anything that forsakes Him). God actually puts this desire in our hearts at salvation – the desire to obey Him and avoid evil. It is what is referred to as “the law of grace” in the Bible. But there is an opposing indwelling force, the law of sin, whose work it is to pull us away from doing the good we wish to do. And so it firstly tries to draw the mind away from the duties it ought to engage in, which is what the rest of this post is about. 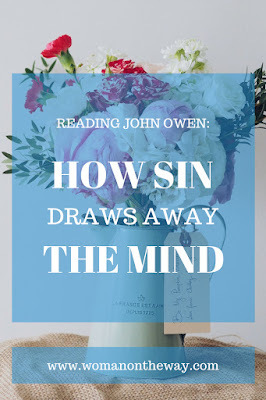 In my previous post on this subject, I discussed why it is necessary for Christians to think about our sin as well as the grace we have received that covers it. The design of it is to lead us to humility before God and others. Humility then leads us to a readiness to be obedient to God and watchful for temptation, calling on him for help. It will try to prevent the feeling of conviction translating to an understanding of the seriousness of sin. I think we have all experienced this too. We tell a lie and immediately feel convicted that it was wrong. But then we start to think of all the reasons why it wasn’t such a bad thing to do. And that prevents our minds being convinced of what our feelings told us in the first place. The feeling of conviction fades, and because we did not come to understand WHY we had that feeling, we do not guard against telling lies in the future. Pretty clever, huh? When our hearts and minds are gripped with a sense of the goodness and kindness of God, thankfulness for all he has done for us and hope for the future he has prepared for us, this does not bode well for sin. Therefore it tries to draw the believer away from these considerations. And there is one strategy – distract the mind with the things of the world. This is why there is the contrary command in Scripture to: “Set your mind on things above, not on things on the earth.” (Col 3:2). The things of the world and God are opposed to each other; therefore one cannot hold both in regard at the same time. “Therefore do not be anxious, saying ‘What shall we eat’ or ‘What shall we drink’ or ‘What shall we wear?’ For the Gentiles seek after all these things and your heavenly Father knows that you need them all. But seek first the kingdom of God and his righteousness and all these things will be added to you.” (Matt 6:31-33). It is not that we must not think of the necessities of life at all, it is that we must not think of them EXCESSIVELY or with ANXIETY, which is what sin would try to have us do in order to push God out of our minds altogether. There is more to say on the drawing away of the mind, but this post has already gone on long enough. I hope you stay tuned for the next installment. 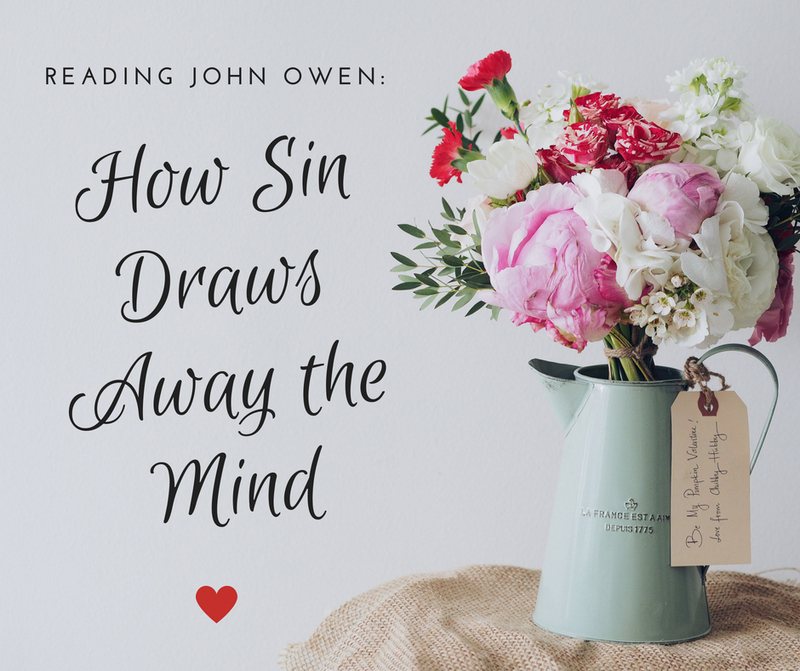 In the meantime, I’d love to hear your thoughts on this – have you experienced the way sin “draws away” your mind? Have you thought about it before? Do you often consider both the vileness of our sin and the goodness of our God? Oh so distracted by the things of the world............ a good book, a movie or TV show, gardening, a shopping list, what to cook for dinner, housework (I know!!) And even, ummmm, blogging.......... Such "innocent" distractions (and virtuous too, quite often). These are the things that keep me from prayer and meditation!